May 25th 2017 Tommy Caldwell and Alex Honnold set a speed record on Free Rider at 5:35. September 2016 the book On The Nose hits the street. September 2015 I climbed The Nose for my 100th time with Fiona Thornewell and Jayme Moye. We did it in classic big wall camping style over four days. more here. June 9th Jes Meiris broke the existing women's Nose solo record. by 3 days. She climbed the route in 27 hours! Jes on FB. May 18th 2014 Hans climbed The Naked Edge in Eldorado Canyon Onsight in a record time of 3 hours and 13 minutes? November 6th 2013 Cheyne Limpe became the second person to climb The Salathe in a day solo! He also set the record, beating Steve Schneider's 1992 - 22+ hour ascent by over an hour, with a time of 20 hours and 6 minutes. Oldest person to do NIAD, (Nose In A Day) was Tuesday October 1st! Eric Perlman 63 years old. His partner was 51 year old Peter Mayfield. Late September 2013 Mayan Smith-Gobat and Sean Leary set he F/M Nose Speed record at 3:28. -New Women's Nose Record by Mayan Smith-Gobat and Chantel Astorga on Sept 23rd in a time of 7:26. They also were the first all women team to do the HD/EC linkup. NEW NOSE RECORD! June 17th. Alex Honnold and Hans Florine climbed The route in 2:23:46. June 5th Alex Honnold climbed, by himself, Mt Waltkins, was reported 2/3rds the way up The Nose at 2am on the 6th, and was supposed to head to climb The RNWF on Half Dome. THE TRIPLE link up SOLO in 24 hours! by the time you read this he will probably be done. 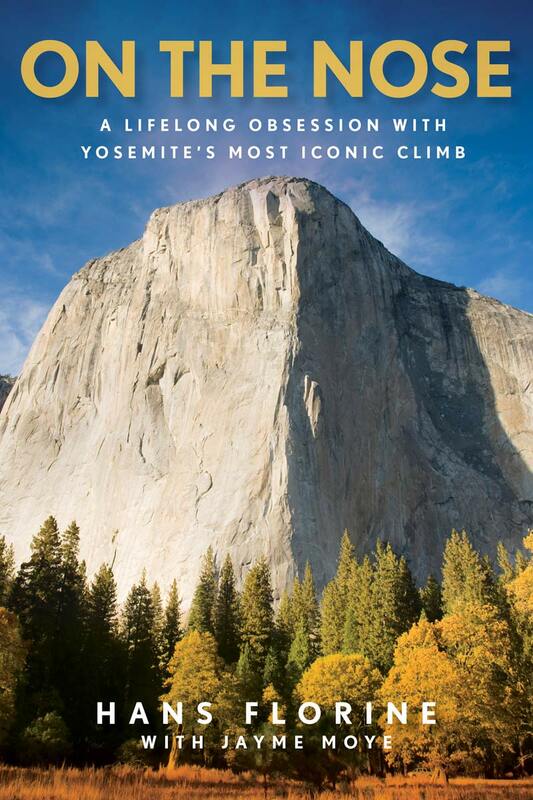 May 19th Alex Honnold and Tommy Caldwell climb Watkins, El Cap, and Half Dome FREE in 21 hours 15 minutes! May 17th Bill Wright and Hans Florine climbed 100 pitches in Eldo in under 16 hours CTC. September 16th 2011 Libby Sauter and Chantel Astorga set the women's speed record on the Nose route. Congrats Chantel and Libby! 10 hours and 40 minutes. Fall 2011 saw an attempt at The Nose Record by Alex Honnold and Hans Florine. Their best time was 3:37:30, just 45 seconds slower than the record set November 2010. 2011 is here, is your New Years resolution to "Climb with Hans?" organization by end of the day Friday January 14th 2011. November 6th - NEW NOSE RECORD! Sean Leary and Dean Potter 2:36:45 ! word has it they will go to do better. Great job guys! November 2010- Ammon McNeely reported to me a few weeks ago that he had completed his 50th different route on El Capitan! He's done more than 65 ascents as well. See more climber's all time ascent tallies here. I hear Sean and Dean are taking goes at The Nose record! I hope they tell us all when they go for a run. - I want to watch! Sean Leary and Alex Honnold climbed El Cap Three times in a day. - around July 5th 2010 or so? Nose-4:17 Salathe-6:00? and Lurking Fear-? Fricken awesome! Alex Honnold became the third person to do THE LINK UP on June 22nd. he climbed Half Dome in the morning in 2 hours and 9 minutes and climbed The Nose in an astounding 5 hours and 49 minutes! he took a 30 ft piece of rope on half dome and a 60 meter cord on El Cap. he only used the cord on El Cap for the aid section just below the boot flake, the king swing, and the great roof. mostly free soloing and shuttling gear for the rest of it. Way to go Alex! Alex Honnold and Ueli Steck Took goes at the Nose Record in early June! Unfortunately their efforts have stopped as Ueli took aproximately a 50 ft leader fall and was shaken up with some scraps and bruiese, but all mendable. see www.supertopo.com or mountainhardware.com for news. Hans is speaking at the Pleasanton Library July 22nd. Hans and Yuji smoked The Nose in 2:37:05 - October 12, 2008. Get an archival quality photo of the ascent: more. YOU can climb The NOSE! You can still read about what happened when we broke the record in July. October 12: We did it! 2:37:05. New Record! Thanks to the four parties that let us go by. Especially Hanah and Hilde and also Paul, Travis, John, Polish party and everyone else and our loving wives. October 8: 2:48:23. We were 6 minutes faster than our record run from July 2nd when we made it to Dolt Tower in 48 minutes! Somehow a few tiny rope snags and roughness on the top half cost us some 11 minutes. Looks like all the marbles are in Sunday's basket. October 5: Yuji and Hans climbed the Nose in 3:38 Sunday afternoon, passing five parties and topping out under headlamp. Yuji's foot is healing nicely from his fall early last week. Big Thank you to Dr Jeffrey of Modesto for working on Yuji, and creating faster healing Sunday morning. We are optimistic about a record run on Wednesday the 8th and Sunday the 12th. October 2nd: Yuji is headed into the Bay Area to do a little gym climbing with Hans while giving his ankle a little rest. He was walking normally today. No noticeable limp. September 26th: Yuji and Steve Schneider climb up the Nose in around 7 hours. September 20 and 21: Yuji and Hans go to Utah High Adventure Mountain Film Festival and accept LifeClimb Achievement Award. September 18th: Yuji arrives from Japan. If you see him in person, ask Hans about this. Hans' top secret, elite athlete recovery training. THE HUBER'S SPEED RECORD,(CURRENT RECORD HOLDERS) HERE AND HERE. Tom Evans does the El Cap Report on Supertopo Forums (unfortunately it can take a bit of hunting to find the current report).